Trenbolin is a very powerful anabolic steroid and the most common form is Acetate. Enanthate Mix Which are extremely in demand among bodybuilders for gaining muscle mass and drying. This injectable steroid, which has gained great popularity, is being produced by a large number of anabolic steroid manufacturers. The main of which are collected in our online pharmacy. Therefore, strongman.biz offers you the highest quality trenbolone at a low price to buy from leading global brands. 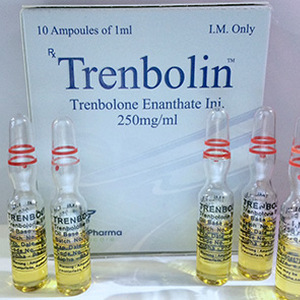 Trenbolin in the US market is not commercially available, so our site will be a good solution to the problem of how to buy steroids, and in particular trenbolone of any ether [long or short action]. The lion’s share of trenbolone manufacturers that enters the US market, provides it in ampoules – 10 pieces. in packaging, as well as in bottles with a capacity of 10 ml, in individual cardboard boxes, where each contains a verification code to confirm the authenticity of the product, in order to buy not the fake products, but the desired quality. Since Trenbolin is a short and long ether, on the course of the steroid injection it is necessary to do either every other day for short in the case of Trenbolone acetate or once a week for injections of enanthate and Mix to maintain a constant level of hormones in the blood. The nominal dosage of Acetate is 300 mg per week. For Enanthate and Mix – 300 – 400 mg. In order to avoid possible side effects, such as an increase in prolactin, the occurrence of gynecomastia, and others. Do not over-dose yourself, and without proper consultation with specialists. The duration of the course may be about 6 to 8 weeks, to continue the course over a month, we recommend using Gonadotropin, as well as Proviron. In no case should you take Tamoxifen, which, thanks to trenbolone, is capable of raising the level of prolactin even higher. Post-course recovery is carried out with such drugs as Clomid and Cabergoline, on the course you will need to use Proviron and Gonadotropin, as well as Anastrozole, depending on the level of estrogen.